Barring any further incidents, the large hadron collider will be ready to start injecting beams tomorrow. The current plan is to test the power systems overnight by running up the magnets. Tomorrow morning they will test the tracking of beam runs and dumps with real beams being injected in the afternoon. That moment will signal the kickoff for this years run during which we hope some real new physics will emerge. Of course the plan changes constantly so we will have to see. At first they will run the beams at the energy of 450 GeV. The beams can be injected into the main ring at this energy without further acceleration. The intensity will also start low with probably just one bunch of protons circulating each way in the rings. The real excitement will begin when they start ramping up the energy to 3.5 TeV by accelerating them in the main ring of the LHC. Last year they were only able to ramp up to 1.18 TeV so when they pass that mark they will be on new ground. 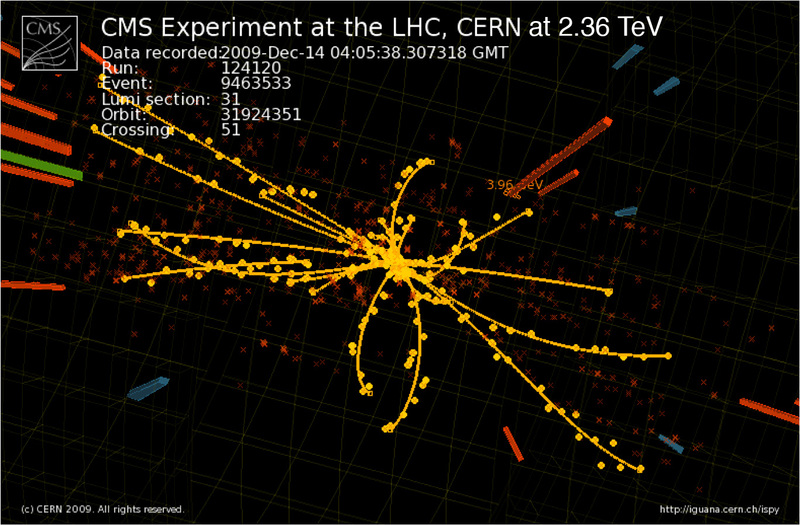 When they collide beams circulating in both directions at 3.5 TeV they will be putting 7TeV into each collision. That is well above what has done before anywhere, so anything can happen. One thing we know that will happen is a big press conference. It is likely to take about 4 weeks to reach that point but the actual progress will depend on what goes wrong. We will be watching closely from the sidelines. From that point they will progress by collecting physics data while gradually increasing the collision rate. This will be done mostly by increasing the number of bunches of protons circulating in each beam. Last year they had 16 bunches in each beam but the accelerator can fit up to about 2800 of them. They will also work on focusing the beams into a tight squeeze at the points where they collide inside the experiments. the net result will be huge numbers of collisions on a scale never seen before. The computer arrays collecting data will be tested at full capacity. One thing we wont know immediately is the scientific results. The groups of collaborators on each experiment will keep that secret until they have official announcements to make. What will they find? More on that later. This entry was posted on Thursday, February 25th, 2010 at 9:17 pm and is filed under Large Hadron Collider. You can follow any responses to this entry through the RSS 2.0 feed. Both comments and pings are currently closed.